Editor’s note: For the past several months, Sustainable Missoula has run a series of articles to build broader understanding of the 0/50/100 sustainability framework: Zero Waste, 50% sustainable trips, and 100% clean electricity for Missoula. This is the last article in the series on Zero Waste. Read the first one here, the second one here, and the third one here. Discarded construction and demolition debris makes up at least two-thirds of all materials in landfills across America, according to EPA estimates – including the Missoula landfill. Our city prioritized waste reduction as a community goal when it adopted ZERO by FIFTY: Missoula’s Pathway to Zero Waste to reduce the solid waste sent to our landfill by 90 percent by the year 2050. Considering the statistics, Missoula’s building sector provides an enormous opportunity for our community to make great strides down the pathway to zero waste. Since its inception in 2003, Home ReSource has worked to help our community reuse building materials to reduce waste and build a more vibrant and sustainable local economy. 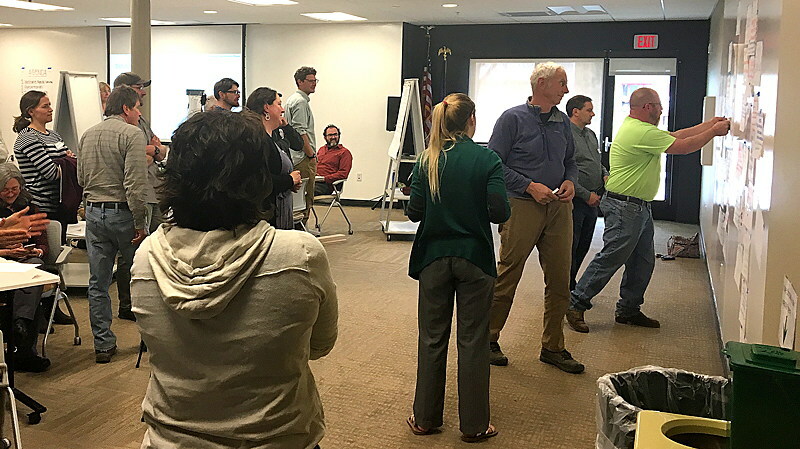 Last week, Home ReSource brought together stakeholders from across Missoula’s building sector for Constructing Solutions, Demolishing Waste: A discussion of waste reduction strategies for Missoula’s building sector to discuss aligning the sector with the ZERO by FIFTY goal. Thirty-two participants, including contractors, builders, architects, developers, lenders, deconstruction and disposal service providers, and city officials engaged in rich discussion and shared valuable insight regarding their motivations, possible solutions, and potential barriers to reduce construction and demolition waste in Missoula. What motivates Missoula’s building sector stakeholders to reduce waste? Nearly all discussion groups noted the potential for job creation as construction and demolition waste is reduced and reuse and recycling is increased. Another prominent idea was the desire to avoid landfill expansion in order to preserve our open spaces. Conservation of resources and shifting cultural perceptions around resources and how we value them were also top motivators. What can be done to reduce waste in Missoula’s building sector? This solution addresses the need for streamlined methods of collection, transportation, storage, and dispersal of reusable and recyclable materials from job sites and may point toward an entrepreneurial opportunity for someone interested in providing this service to contractors. Participant ideas that support this solution include: increase public knowledge about deconstruction; promote methods for designing for and tracking deconstruction; and improve the permitting system for deconstruction projects. This solution recognizes that Missoula’s building sector at large may not know about best practices for reducing C&D debris and points to the need for trainings and access to educational resources. Participant ideas that support this solution include: municipality-supported and -enforced standards for deconstruction; Job Site Waste Management Plans; and expedited permitting, waived or lowered fees, and community spotlight for plans that demonstrate excellent waste reduction practices. The Missoula Design Excellence Overlay outlines architectural design standards and guidelines for projects in Missoula’s primary commercial areas. Participants proposed adding a waste reduction component to this set of requirements. Other popular solutions included creating a construction and demolition waste transfer station or sorting facility and developing local markets for recycled and reusable materials. While these and other solutions likely hold the answers to reducing Missoula’s construction and demolition waste stream, challenges to implementing them exist. Knowing that, participants helped illuminate potential barriers to overcome including assessing the time added to divert materials & potential added project cost, existing attitudes & cultural norms that lead to wasteful practices, and lack of existing services & educational resources. Thanks to the contributions of the participants, we have the origins of a strategy to reduce C&D debris in our community. Based upon the information from this discussion, we are working to prepare a set of recommendations as well as a in-depth report for Missoula’s building sector stakeholders. Our hope is that this discussion becomes the foundation upon which our community will construct a thriving & sustainable future for Missoula’s building sector. Constructing Solutions, Demolishing Waste: A discussion of waste reduction strategies for Missoula’s building sector was supported by leading sponsors Jackson Contractor Group and MMW Architects, as well as supporting sponsors Berkshire Hathaway Montana Properties and Blueline Development Group. Sarah Lundquist is a master’s degree candidate in environment studies at UM and an intern at Home ReSource. Jeremy Drake is community engagement manager at Home ReSource. This Sustainable Missoula column is brought to you – via the Missoula Current – every Friday by Climate Smart Missoula and Home ReSource. April 13-19. International Wildlife Film Festival. Featuring films on wildlife, ecosystems, climate change and more. April 13. World’s Largest Garage Sale. Reduce waste, buy/sell already loved items. UM’s covered parking garage. 9am to 1:30pm. April 20. MUD’s Annual Earth Day Celebration. At the MUD site, 12-4pm. April 20. Clark Fork Coalition’s Annual River Clean Up. Starts at Caras Park at 9:30am. View more climate and energy events via Climate Smart Missoula’s Calendar. There are many more EARTH MONTH and conservation events for 2019 HERE.